If the geranium flower began to form pods these can be collected. Gather the pods before they burst open. Dry the pods completely and store in a sealed dark container in a cool area. Sow the seeds in February for a the same years as they are slow growing. 13 to 15 weeks to flower after sprouting. Remember if the plant is a hybrid the seeds may be sterile and would most likely not be true to the parent plant. 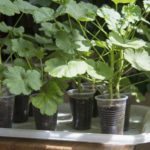 Cuttings are the recommended method of propagation for Geraniums.